It is everyone’s dream to travel internationally and not everyone gets that chance. I happen to be a lucky fish in the sea, by getting the opportunity to travel abroad. Nothing beats hard work and pushing yourself, in order for you to be a better person in life. Not working hard for anyone but for your own benefit. As we all know, it is really hard to be on top of the mountain because there are stones that might crush you while you are still climbing. Once crushed, you are discouraged from going back and trying again. However, having the support of people who see potential in you and are willing to guide you in your journey makes it easy to keep going despite the stones. 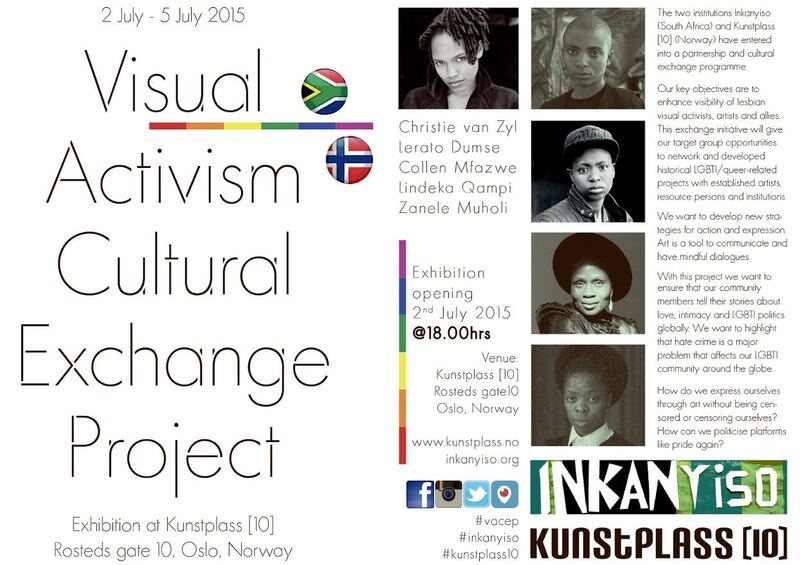 When I received an email from Inkanyiso team saying I need to prepare my passport and apply for a visa for overseas trip to participate in a Visual Activism Cultural Exchange Project (VACEP 2015). It didn’t really excite me, not because I didn’t believe that I got the chance to travel but knew that applying for a visa is a stressful process. There are high possibilities of being declined, meaning I might not go. Lerato Dumse and I did an online application and everything went well. We got an appointment date and time. On the day of my appointment I got lost and went to the Norwegian Embassy instead of the visa service centre. I got there at 12:15pm instead of 11:15am. I was still lucky because Dumse was already there on time and told the person who assisted her that I’m on my way as well. The consultant at VFS Global in Pretoria was extremely friendly. She didn’t ask many questions. Still I was not excited, I had normal feelings. I received an early morning phone call on 15 June 2015 that said, “your visa is ready.” I didn’t waste anytime, I woke up, took a bath and hit the road. When I got back from collecting my passport my family was really excited since I’m the first person in the Mfazwe family to travel abroad. That’s when I started to be excited about my trip. 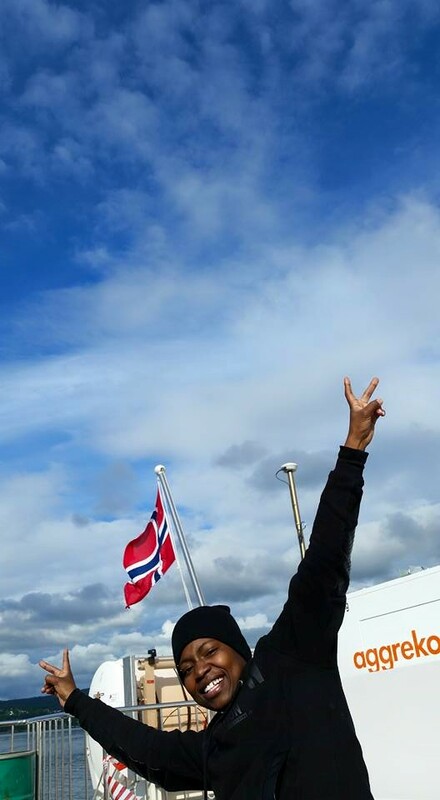 I left home on the 18th of June 2015 for Oslo, Norway. My Aunt Sbongile Mfazwe and sisters Zandi, Zani and Thandazo were excited but scared at the same time. They were scared because I’ll be away for 19 days and I will be outside the country, far away from home. The only person I was missing, to share the moment with us was my mom. I know she’s always with me in spirit. The funniest moment on the day I left was the fact that I went to buy new toiletries because I didn’t want to use my old one. I bought 2 new body sprays, roll on, toothpaste, Vaseline and lotion. I arrived at the airport early thanks to Lebo Mudau for driving me to OR Tambo international airport. I checked in one bag and took the other one with me. When I reached customs they checked my bag and found that I had toiletries with me and said, “you can’t take these things with you.” I was supposed to put them in my checked-in bag. I had to throw them away. It was really hard to see my stuff go in the bin. Lesson learnt, it is always wise to do proper research in everything that you do. Life goes on, and it’s not like I was going alone. I had my family with me, not the Mfazwe family but people that I rely on. Last week Monday, we posed for a photo with Fikile Vilakazi. (2015/06/23). Photo by Vibeke Hermanrud. I wrote an article before about our boarding house where I say ”They say blood is thicker than water but blood doesn’t make a family, love does”. I was travelling with Emirates airlines. The food and drinks were nice, but the long distance was frustrating. I had never travelled for so many hours before. I took a nap, woke up, ate and napped again, woke up to eat again. I watched a movie thinking time will move fast but it was like time was not moving at all. We arrived at Oslo airport the following day we joined the customs check-in queue to verify that we had permission to enter the country. The (male) customs official who was checking my passport didn’t understand why I was visiting Norway. I tried to explain but he still didn’t understand. The worst part was that I didn’t print my return ticket, so in his mind he may have thought that I had no intentions of returning back to South Africa. He called his assistant to double check my passport and fortunately I was not traveling alone and one of my colleague/family had her hardcopy return ticket and that was my rescue. Finally my feet were in Oslo, a busy city with a nice environment. 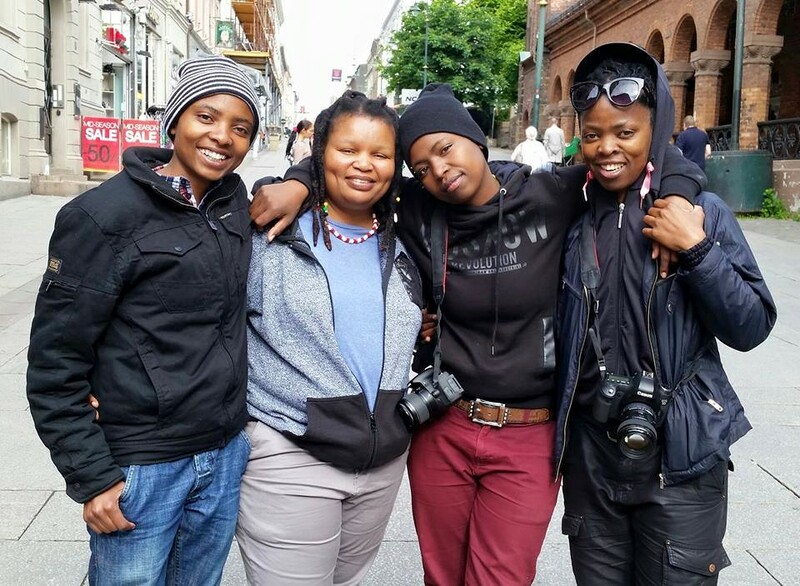 As we commemorated youth month in South Africa, Oslo celebrated LGBT pride. When we arrived in the city, the first thing that I saw were rainbow flags flying high. That was really nice to me, knowing that in different places they celebrate pride in different ways which is a good experience. I’m in Oslo at home not in a fancy hotel but in the warm place where we speak the same language, visual arts and activism. 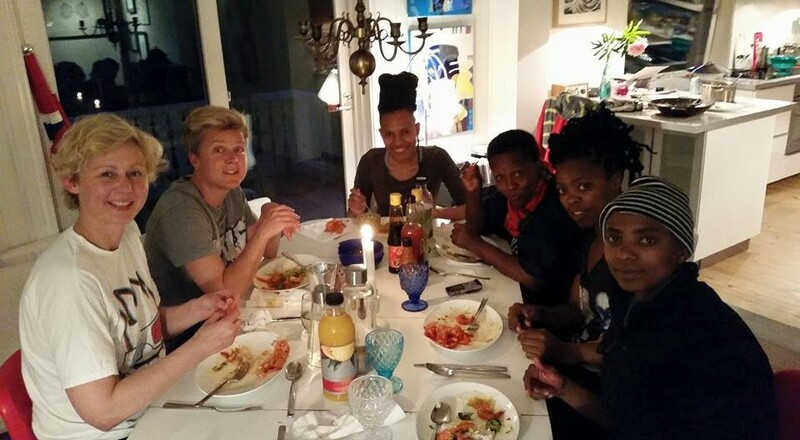 Our new family Vibeke Hermanrud and Henriette Stensdal are the lovely couple who welcomed us in their home. We are collaborating with them on cultural exchange project. They are good to us and they do their best to show us all the corners of Oslo. They have introduced us to friends who speak the same art language. The place is really beautiful, we are surrounded by nature, green trees and overlooking the sea. The public transport we use is good and efficient. Traveling by boat to town from home was remarkable and nerve wrecking considering that I can’t swim. I’m scared of water, but I was really excited when I was on the boat. 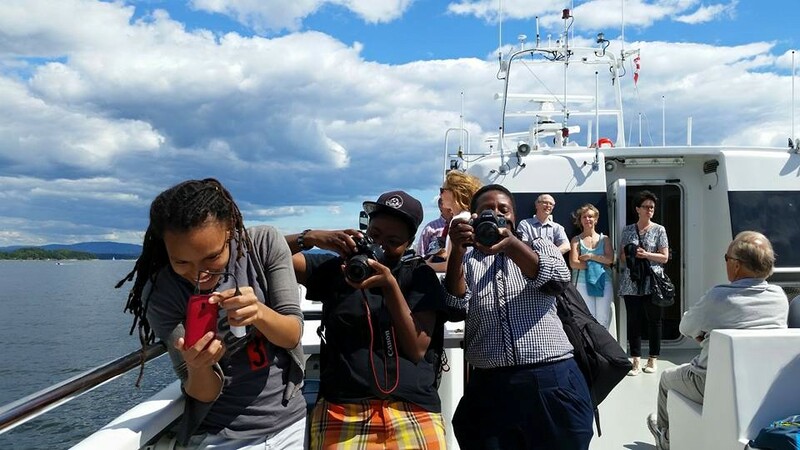 Collen on the boat from Asker to Oslo city (2015/06/23). Here we have access to high speed internet connection. The sunlight (natural light) lasts longer than at home. Since I’ve been here I haven’t seen the dark side of Oslo. We travel late within the city, the sun goes down around 12:00 to 12:30 at night which is weird at the same time. It is a great experience and we feel safe. Nice place nice buildings the architecture and people are always on point with their outfits. 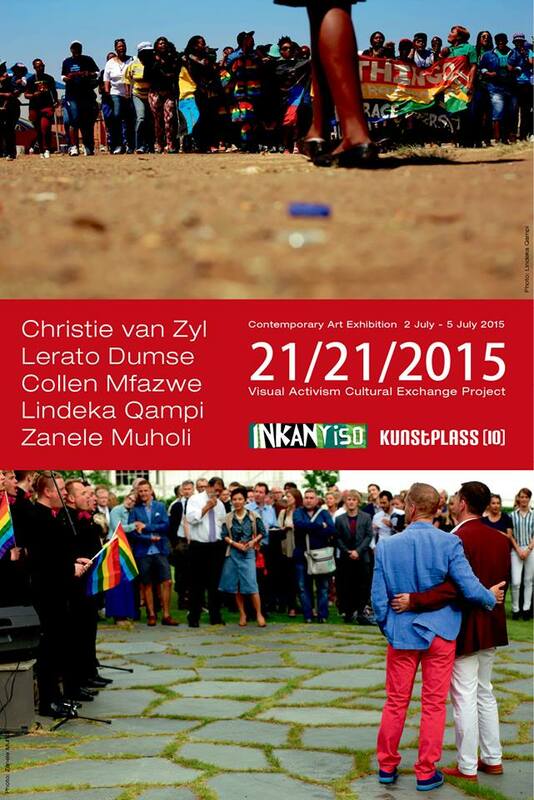 This entry was posted in Activists Act, Art Edutainment, As we are, Before You, Collectivism, Community, Love and tagged 2015 June 19: Travelling to another country is not the same as travelling to another province, activism, Activism; Writing; Readings; Article; Archive; TransIA; Response; Black lesbians; Gaysbian; Transgender; Sexuality; Gender expression; Sexual Orientation; Gender Queer; Gender Neutral; Gender Variant;, Allies, Appointment, Articles, beauty, Black lesbians, Camera work, Christie van Zyl, Collaborations, Collen Mfazwe, community, Customs, exhibition, Experience, Expression, Extended family, Family, Fashion, Fikile Vilakazi, Friendships, From Johannesburg to Oslo, Henriette Stensdal, Human beings, human rights, Inkanyiso media, Kunstplass, Lerato Dumse, Lessons Learnt, Lindeka Qampi, Norway;, Oslo Pride, Passport, Photographer, Pretoria, Relationships, Respect, Sexuality, Toiletries, Travel heals, Travelogue, VACEP 2015, Vibeke Hermanrud, Visual activism, visual narratives, Voices, We love photography, Writing is a Right, Zanele Muholi. Bookmark the permalink.